What special items do you pop in your kit bag if you are an England cricketer heading off on tour? Captain Alastair Cook likes to take a dart board with him. For others, television box sets and games consoles help to while away the hours during downtime. The wonderfully eccentric former England wicketkeeper Jack Russell would not leave home without several boxes of Weetabix, enough tea bags to feed his 30-cups-a-day habit, biscuits, mashed potato, baked beans and HP sauce. Alongside Russell's creature comforts, James Tredwell's penchant for home-made jam and chutney appears decidedly modest. But that will not make the off-spinner any less popular in the team room in Sri Lanka, where England play seven one-day internationals in the next three weeks, starting in Colombo on Wednesday. "I've got a bit of a patch where I grow my own fruit and veg so I make some chutneys and jams if I have a bit of a glut," Tredwell told BBC Sport before departing for the island off the Indian subcontinent. "I've got a couple of chutneys this year which I might sneak into the bag to Sri Lanka but customs tend to be a bit tight these days. "When we're in Bangladesh and places like that, where the food can be quite temperamental at times, it can be quite nice to have a bit of home comfort. At other times, it's just a good way for me to get rid of it. I have that many jars of it in the cupboard, it's nice to take it away and let the boys enjoy it." Won one Test cap, against Bangladesh in 2010. He took six wickets in the match at an average of 30.16. In 17 Twenty20 internationals, Tredwell has 32 runs at 10.66 and seven wickets at 59.42. If Tredwell's panache with preserves make him a popular tourist, on the field the unassuming Kent twirler has become an increasingly important part of England's one-day plans. Even when former England spinner Graeme Swann was still ripping through Test line-ups, Tredwell, 32, was often preferred in the limited-overs format. A purveyor of old-fashioned off-spin with little of his team-mates' X-factor, he has earned the nickname 'Ronseal' in some quarters for his unfussy approach. As England begin fine-tuning their preparations for the World Cup in Australia and New Zealand early next year, Tredwell is now rated the 12th-best bowler in the International Cricket Council's official ODI rankings. 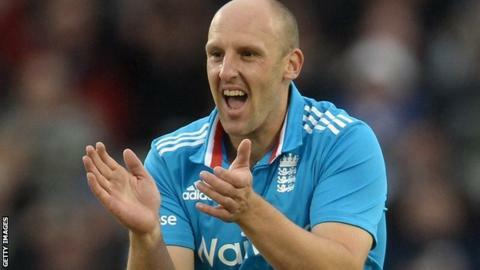 Tredwell looks a steady cricketer and he is one who keeps improving. Rather than being "worked out", his graph is on an upward trajectory. "Treddy is an old-fashioned, orthodox off-spinner," says Kent coach Min Patel, who played two Tests for England. "He goes under the radar a little because he doesn't bowl a doosra or have any mystery, but his stats show that he ranks with the best. "He's not flashy - he's a quiet, unassuming lad who doesn't crave fame. He likes to life the quiet live in deepest, darkest Kent but on the cricket pitch he's as reliable as anyone. "He knows his role in the England one-day team and has been working hard on individual plans which can be tailored to various opponents this winter. "Whether it's David Warner, Chris Gayle or MS Dhoni, Treddy has shown he can compete." Tredwell is regarded as something of a one-day specialist in the county game too - he was loaned out by Kent last season to play four-day cricket for Sussex. During the same period, he continued to play white ball cricket for his parent county. Adapting his game to confront some of the world's most aggressive one-day batsmen is a challenge he will continue to pursue in Sri Lanka. On the limited-overs leg of England's tour of Australia last winter, Tredwell was targeted for some rough treatment from the likes of Warner, Aaron Finch and Glenn Maxwell. He failed to take a wicket in three matches and was plundered for almost 100 runs at 4.57 per over. "It can be daunting," added Tredwell. "You just have to back yourself, be brave and stick with what has worked well. "Some batsmen are beginning to take me on but equally, with the field restrictions the way they are, it can be a good time to pick up the rate when the spinner comes on. "Generally, if you are confident and believe in what you are doing, they can have their day and equally, you can have yours."